Cats have a natural urge to scratch. 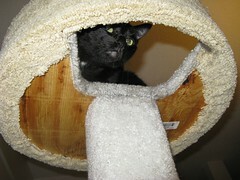 Scratching on a sisal scratch post acts as a sort of therapy or stress release for your feline. It also assists your cat in the removal of layers of their claws for claw regeneration. If you do not provide your feline with a scratching post, you may see the negative results on your sofa or your favorite carpet, etc. Therefore, to avoid any such domestic mishaps investing in a cat condo otherwise known as a cat tree is a good idea for your cat as well as your home.